Air France Flight 4590 was a charter flight from Paris Charles de Gaulle Airport, France, to New York's John F. Kennedy International Airport, New York City. There were 100 passengers and nine crewmembers on board. 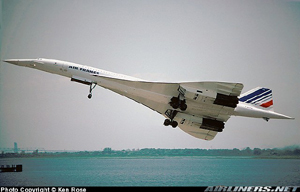 The fully loaded Concorde began taxing towards runway 26 at approximately 1434 local time. Weather at the time of the accident was clear, and winds light. Takeoff began at approximately 1442 with planned target speeds of V1 of 150kts; VR of 198 kts; and V2 of 220 kts. The takeoff progressed normally until a few seconds after passing through V1. It was learned by investigators that at that point, one of the tires on the left main landing gear (tire no.2) struck a small piece of sheet metal that had fallen from the no. 3 engine of a DC-10 that had taken off five minutes earlier. The no. 2 tire immediately failed, sending debris into the underside of the airplane and left wheel well. It was determined that the largest tire debris did not penetrate the wing surface, but generated a high pressure surge within the no. 5 fuel tank, resulting in at least three areas of tank surfaces failing outward, and generating a massive fuel leak. The fuel leak, located forward and inboard of the nos.1 and 2 engine inlets, almost immediately ignited. The takeoff continued, although the ground track began drifting to the left side of runway 26. The pilot rotated the airplane as it passed over the left edge of the runway. After liftoff, engines 1 and 2 began to malfunction, with no 2 being more severe. Within a few seconds following liftoff, the fire warning alarm sounded on no. 2, resulting in it being shut down by the crew. The plane climbed to an altitude of approximately 200 feet, and airspeed of approximately 200 kts, but was unable to accelerate or climb. After about 60 seconds, no 1 engine began to fail, followed by decay in airspeed and the inability to maintain level flight. The airplane stalled and crashed into a hotel approximately 90 seconds from the beginning of the takeoff roll, killing all 109 passengers and crew on board, and four persons on the ground.